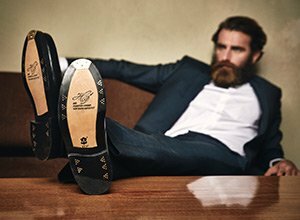 The finest Budapest men's shoes from Germany's most exclusive men's shoe brand - masterfully handcrafted since 1879. Order from us like you would in the US! To provide you with the best possible shopping experience, we have just expanded and improved our services especially for you. The total amount you pay at the end already takes all the custom fees and taxes into account, which means you do not have to pay anything at your doorstep when your parcel arrives. In addition to that, benefit from our free shipping to the USA if you buy at least 149 USD worth of products. And if your shoes do not fit you, all returns are also for free when using our return label. Two-layer stitched belt in blue, crafted from suede leather. Classic cap-toe Oxford in dark brown with closed 6-eyelet lacing. Two-layer stitched brogue belt in black, crafted from French calf. Classic full-brogue Oxford in black with closed 5-eyelet lacing. Two-layer stitched belt in dark brown, crafted from suede leather. Elegant shoe tree, crafted from the aromatic cedar wood. Two-layer stitched leather belt in cognac, crafted from French calf. Two-layer stitched leather belt in burgundy, crafted from shell cordovan. Two-layer stitched leather belt in black, crafted from French calf. Two-layer stitched brogue belt in dark brown, crafted from French calf. Two-layer stitched leather belt in green, crafted from French calf. Two-layer stitched leather belt in white, crafted from French calf. Goodyear-welted stingray Derby in black with open 3-eyelet lacing. Two-layer stitched leather belt in black, crafted from rayfish skin. Two-layer stitched leather belt in brown, crafted from ostrich leather. Two-layer stitched belt in black, crafted from suede leather. Two-layer stitched leather belt in bordeaux, crafted from box calf. Two-layer stitched leather belt in red brown, crafted from French calf. Classic plain Derby in black patent leather with open 4-eyelet lacing. Cleans, treats and protects the patent leather—for a perfect shine. Two-layer stitched patent belt in black, crafted from French calf. We would like to support you! With more than 17,300 certified online shops, Trusted Shops has been the leading trust mark for safe online shops in Europe. Its success is based on the exceptional combination of retailer certification, seller protection and customer service. Trusted Shops offers independent guidance for Internet buyers thanks to real customer reviews. eKomi is an independent customer feedback system. Thanks to web-based technology, it develops and operates genuine customer feedback about products and services. The eKomi service seal guarantees customers a great orientation, transparency and security when buying online. The delivery label is a special, independent system used in E-Commerce to measure and control the shipping quality. The label indicates the total amount of orders which have been shipped in the past 24 hours. The daily and automatic actualisation of the delivery speed allows an insight into the delivery process in real time. The journal “Internet World Business” rewarded SHOEPASSION.com with the “Shop Award” 2012 for the best product presentation. The expert jury explains: illustrative product images, comprehensive product texts as well as shoe care advice provide more information than almost any bricks and mortar shoe retailer.